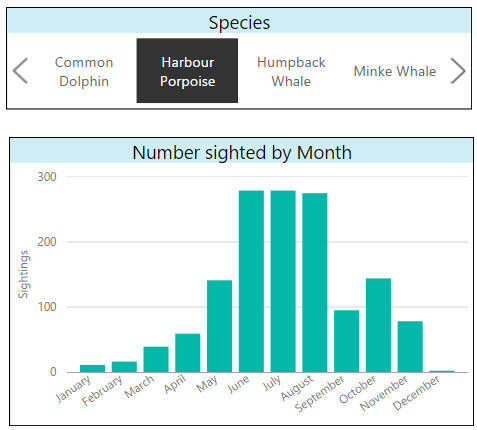 Create a new Power BI Desktop file, and load into it sightings of whales and porpoises from the Whale and Dolphin Trust. You can use the link on this page. if you haven't got an Internet connection, or want to ensure you see exactly the results in this exercise, load data from the CSV file in the above folder instead. This slicer has horizontal orientation (although you can probably see that yourself). Apply a filter to your visualisation so that it omits any sightings by people called Jan.
Save this workbook as Sense of porpoise, then close down the Power BI instance containing it.